Kennel Cough (also known as canine infectious tracheobronchitis) is a highly contagious respiratory disease. Dogs commonly contract kennel cough where large numbers of dogs gather, like boarding kennels, daycare facilities, in parks and at dog shows. Kennel cough is spread through airborne droplets, direct contact (e.g., touching noses), or contaminated surfaces (including water/food bowls). It’s highly treatable in most dogs but can be more severe in puppies younger than six months of age and immunocompromised dogs. Although kennel cough is easily treatable in healthy dogs, it’s important to report any coughing to your veterinarian because it could be a sign of a more serious disease. The canine distemper virus and canine influenza virus both start off with symptoms nearly identical to kennel cough. Coughing is also a symptom of asthma, bronchitis and heart disease. Mild cases of kennel cough are treated with a week or two of rest, but a veterinarian may prescribe antibiotics to prevent a secondary infection and cough medication to ease the symptoms. It’s important to use a harness and not a collar to walk a dog with kennel cough because irritation of the throat can aggravate the cough and possibly even cause damage to the trachea. 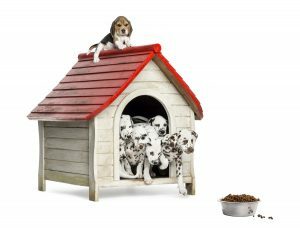 If you have a household with multiple pets, it may be useful to separate them as much as possible or at least to separate their water and food bowls to prevent the sick dog from infecting the other animals. Humans cannot catch kennel cough. Vaccination is your best bet, though because the virus can be caused by different strains, it is not a 100% guaranteed protection. 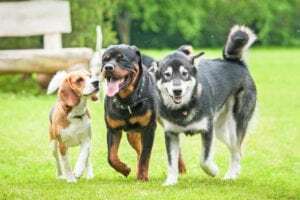 Dogs that are frequently boarded, visit doggie day care, compete in canine sports, or are otherwise are exposed to large groups of dogs may benefit from the vaccine, and many training, boarding, and daycare facilities require proof of vaccination. Most kennels will not accept your dog for boarding with a vaccination certificate. The vaccine is usually initially given in two doses two to four weeks apart, followed by a booster every six months to a year.